Give in to the charms of Molde, capital of the county of Romsdal, in the south-west of Norway, and discover a landscape sprinkled with roses, the flower that has become a symbol of the city, and other interesting activities. We leave the port and head for the centre of Molde, administrative centre of the County of Romsdal. The city is located on the shores of the Romsdal fjord, surrounded by hills that provide a backdrop of 222 peaks that are covered in snow almost all the year round. 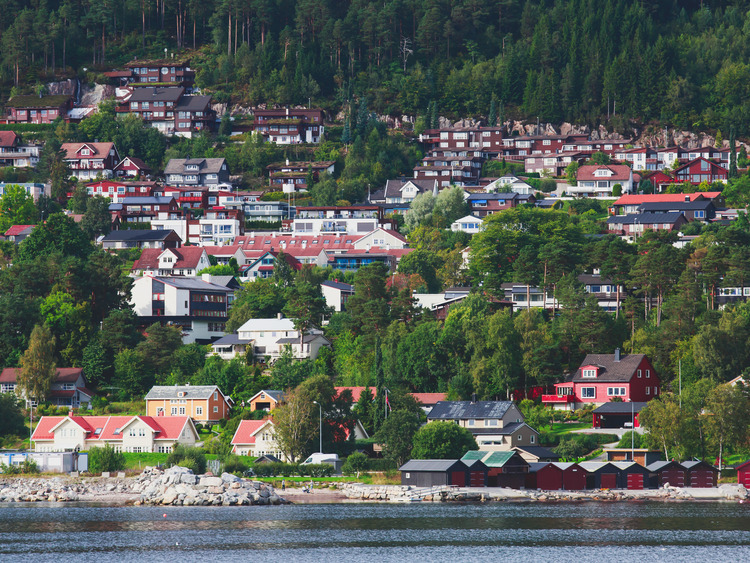 Molde is also known as the City of Roses, thanks to the fragrant rose nurseries that benefit from the mild climate and fertile soil of the sun-drenched slopes surrounding the city. Our tour then takes us to the Romsdal Museum, a large open-air folk museum complex comprising 50 traditional buildings that not only recount the history of Norway, from the Vikings to the present day, but also provide examples of the architecture, traditions and the way of life of the local population. The most interesting exhibit is Bygata street, a reconstruction of a 20th-century street that highlights the evolution of houses in this part of Norway. The next stop is Molde Cathedral. Consecrated in 1957, it boasts a beautifully decorated interior. Standing next to the church there is a 50 m-tall bell tower, which is capped with a copper-clad pyramid. Our last stop is the Varden viewpoint, a vantage point 400 m above sea level, where we can immortalise the view of Molde and the surrounding fjords with a photo or two. Only a limited number of Italian speaking guides are available.